We all have that one (or five) perfect summer bag. It's light and pretty- exactly how we all want feel! 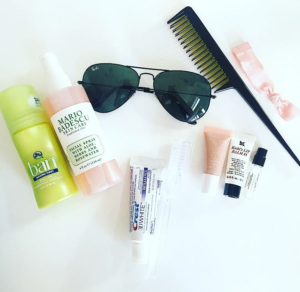 Take a peak inside Basic Beauty's Perfect Summer Tote to see what we think every woman should be carrying around this season. Rosewater Facial Spray: Use this whenever you need a quick refresh during your day. This is a major multi-purpose product for the summer; after the beach, post-workout, 90 degree BBQ (it will keep your makeup in place! ), and the list goes on! Lip Balm w/ SPF: Even if you like to wear something over it- always base your lips with SPF during the summer. Sunburnt lips are not only painful to have, but painful to look at! Nip that in the bud. Keeping something simple like Alba Botanica lip balm in your bag will serve you well. Hair: Depending on your hair's natural way, throw a bottle of sea-salt spray (we enjoy DryBar's Mai Tai Spritzer) to enhance your curls on a hot or beachy day. Or simply carry a mini hairbrush and hair-tie to pull it back into a sleek (sweaty) pony or our favorite sloppy bun! Deodorant Wipes/Body Spritz: Sometimes the summer heat doesn't help to keep us totally fresh. When you need a lifeline it's nice to have a remedy right in your bag! This is where all those random perfume samples you end up with come in handy. Water: Hydration; the key to beauty! << And making it through a heatwave. Sunglasses: Squinting wrinkles are real. Add any other do-dads you find necessary . Please click here at YBB with any of your summer tote favorites that we should know about. We would love to hear from you. Now you are Summer ready. Grab your bag and go about your day! You're covered.